Celebrate a galaxy far, far away with Underground Toys' line of plush collectibles! Star Wars has transcended generational barriers and stands the test of time as one of the most beloved stories of all times. This rendition of Rey shows the attention to detail that the character deserves as itâ€s truly represented in the movie. 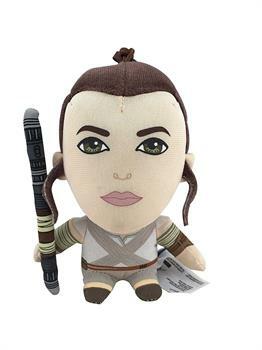 Standing 4-inches tall, this mini Star Wars talking Rey plush features phrases from The Force Awakens! Features a plastic clip-on ring so you can attach mini Rey and take her everywhere! Celebrate a galaxy far, far away with Underground Toys' line of plush collectibles! This rendition of Rey shows the attention to detail that the character deserves as itâ€s truly represented in the movie. Talking Rey plush features phrases from The Force Awakens! Features a plastic clip-on ring so you can attach mini Rey and take her everywhere!